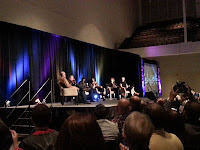 The Star Trek: Next Generation panel at 2013 Boston Star Trek Convention, with Michael Dorn, Brent Spiner, William Shatner, Lavar Burton, Marina Sirtis, Gates McFadden and Denise Crosby. 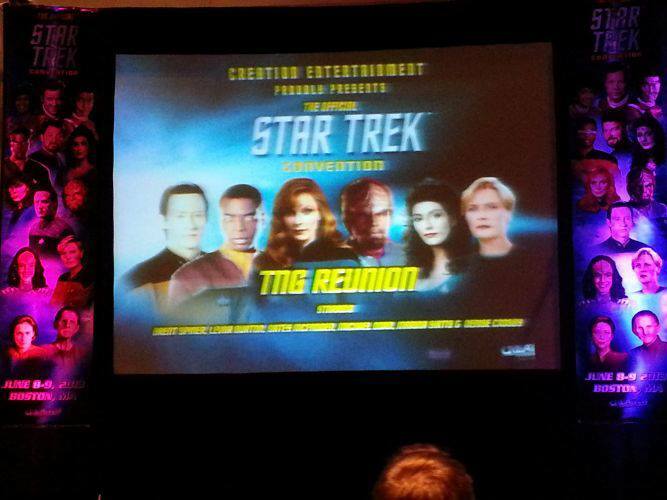 This was the first convention I had attended in over five years and I was very much looking forward to this panel. That, getting to see Gates McFadden again, and meeting up with a friend I hadn't seen in ten years were my only reasons for going. Shatner was the moderator. You know, I actually liked his show where he has one on one interviews, but as moderator of a Next Gen panel he was not very good. He interrupted the cast, moved so slow through the long lines of fans and would get stuck on certain questions that interested him but the crowd clearly had their answer and was done with it. It was also very visible how the cast got very annoyed at certain points but was trying to be polite. There was one question concerning the first season episode "Code of Honor" and racism. It started out as a thought provoking discussion, but Shatner would not get off the subject once started. Then he basically hounded Denise Crosby as she answered a sexism question and even though she had answered his question - 3 times - he kept on her. By that time the crowd had had enough. I may be off but I believe only about a half dozen fans got to actually ask questions. Marina Sirtis, who proved through the entire panel how bossy she can be (which she admitted) finally pushed Shatner into moving things along, but by then it was too late. It's a shame really, because the tickets to the panel were NOT cheap and I don't feel the audience got their monies worth. 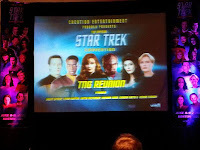 Sirtis took over at several points throughout the panel. She did tell a very funny story about getting on the FBI watch list due to yelling at the TSA at an airport. Her and Michael Dorn acted a bit of it out. Brent Spiner answered questions with his usual sarcastic humor. It's funny, but sometimes fans do want a real answer. I know it must be tiring hearing the same questions but there are new fans every year due to syndication and Netflix. I love Brent, but sometimes it feel he walks a very fine line between funny and rude. I'm a huge fan of Gates McFadden and liked that she had a few opportunities to speak. We got to hear the real reason she was not in season two. Gates thought that there was more of an "open door" policy with the writers and would speak up about issues that she had with some scripts. Apparently head writer Maurice Hurley took offense to her suggestions. By the third season he was gone and she was back. It turns out the cast learned that when you wanted changes made you went to Patrick and he would get them made. Overall, great to see them together but honestly not worth the price of the ticket. Next time, when Patrick Stewart can't make it (he was supposed to be the moderator) pick another ST:TNG cast member, not Shatner. Sorry Bill.